Last week I wrote a post reflecting on the first week of LB’s inquest last year. It focused on some of the themes that emerged in that first week, the sprinklings of candour, the constant undercurrent of mother blaming, the contradictions and flaky knowledge of epilepsy, even then, years after LB died, years after Southern Health had rolled out training to staff. This last week we continued sharing and re-capping on the tweets, but my blood pressure just kept rising. Re-reading the tweets a year on offers a valuable perspective, I found myself taken back to that court room in an instant, and reading tweets aloud in my head in the voice of the various legal counsel. Here are some thoughts, for what they’re worth. It is the case currently that families can find themselves facing an inquest with no financial support for their legal costs, while the Chief Coroner has recently recommended this be changed, at present the inequity of arms is horrendous. There were eventually eight legal teams at LB’s inquest, a number of staff witnesses having been cut adrift by Southern Health a few weeks before it started, bringing the number up to eight teams of varying levels of preparedness. Someone asked me what it would have been like if Sara and Rich didn’t have legal representation, and to be honest I think it is beyond my comprehension what that experience would have been like for LB’s family. It was such a bruising and battering experience with the best legal representation available, I genuinely can not imagine what would have happened if they’d been there with no support. As I re-read tweets in Paul Bowen‘s voice in my head I realised what a truly skilled craftsman he is. Revisiting a year later is a bit like going to see a film of a book you’ve already read. You know the ending, you know the cast, you know more or less what will happen, but the tweets captured the skill of those legal professionals at work. While Paul may have been the one in the spotlight, he had a truly brilliant legal team working with him including Caoilfhionn Gallagher, Charlotte Haworth-Hird, Esen Tunc and Keina Yoshida. These pesky ‘activist, left-wing human rights lawyers‘ juggled the demands of LB’s inquest, with other cases and families who needed their support, with their own families and lives, travel in the UK and internationally, and have somehow honed the ability to function brilliantly on less than 4 hours sleep a night. They worked tirelessly, day and night, preparing new information and documents, reading up on the intricacies of the law and other legal precedents, up-skilling themselves in knowledge of epilepsy to a level that far exceeded many of the professional staff, and amongst all of this they never forgot that it was about LB. They really were amazing, and so human and careful and committed. It was a real privilege to see people work so hard, and get the results that deserves. This is what they have to say about him. I’m sure Alan is very good at his job ‘mostly defending professional people, in cases of fraud, regulatory or sexual offences’, and I suspect that mother-blaming is just one technique in his arsenal of skills. One of the things I struggled with at the inquest (and reflecting on it since) was the performative nature of it. The legal teams appeared to be going through the legal motions at times, almost like a well rehearsed game, it is just a job to (most of) them at the end of the day. I’m sure AJ didn’t think for one minute about the impact of his words on LB’s family, or if he did he quickly dismissed any bad taste in his mouth, because all is fair gain when one is going for the win for one’s own client. This man sat next to Sara or Rich for the entirety of their son’s inquest and didn’t hesitate to suggest that the blame for LB’s death should be laid at the feet of ‘the mother’. It’s so inhuman, and from the families I’ve spoken to who have had inquests elsewhere, so common. Hand in hand with the mother blame was a continual passing of the buck, like a hot potato that no-one wanted to hold for too long. The exception to this was Winnie who’s candour will remain with me for life, she repeatedly took full responsibility for what happened to LB. She was no longer working at the Trust, which may also be related to her preparedness to take responsibility, but at no stage did anyone share the responsibility. At no point did anyone acknowledge what the rest of us felt, yes she let LB down, yes with awful consequences, but she wasn’t working in a vacuum and she wasn’t wholly responsible (in my opinion). Striking how much inter-professional buck passing features in @LBInquest: nursing v medical; managerial v front line. And family blaming. The rest of the time was an elaborate blame game, of blaming each other, where the psychiatrists counsel tried to blame the nursing staff and ‘the mother’; where the second psychiatrist tried to keep her head down (despite the most woeful performance on a 999 call I have ever heard – it took the call handler over a minute to ascertain an ambulance was required urgently, she thought a 4hr response window was appropriate due to the complete absence of urgency being communicated); where blame was passed between Band 5, 6 and 7 nurses (I think, I lost count of the bands); where Lesley Stevens, Medical Director, stood up at the end and tried to persuade the jury there was nothing to worry about because the staff were *now* fully trained. Maybe LB’s inquest was just ahead of its time somewhat as we find ourselves increasingly in a culture that seems to dismiss and diminish expertise; there was no absence of diminishing expertise on show. Ten weeks after LB’s death the CQC visited the STATT unit where he died, the results of that inspection are damning. The service was inspected on ten domains and failed on every single one of them, six enforcement notices were issued and the unit was shut down, never to reopen. PB puts Verita conclusions to GJ, is that a conclusion you agree with? Dr Jayawant infers that they just didn’t manage to perform on the day, a cracking insight into how Southern Health view the regulator. This diminishing of expertise wasn’t reserved wholly for the regulator though. PB: Presumably you did that and asked his family for this information? I’m still confused by that stunt, maybe it’s an example of AJ’s ‘light touch that works magic’. What I am crystal clear about is that any notion of no-blame culture in the NHS is nothing but a pipe dream. Again, maybe this is a sign of the times we live in, but the spin at play when people are caught out failing makes me want to scream. It’s a sort of two step to try and dance on past the reality/poor inspection report/unexpected death. 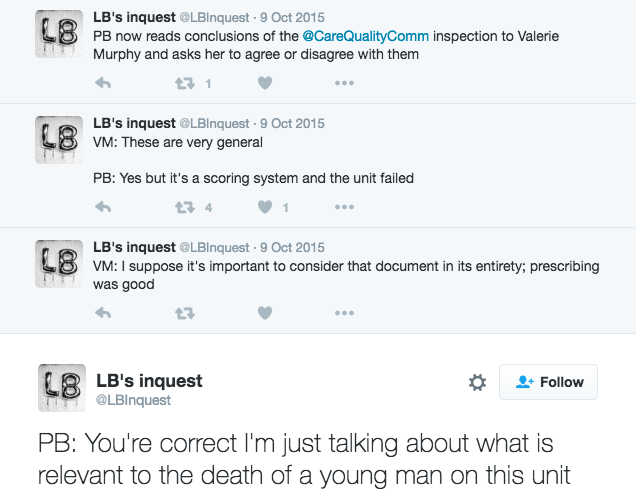 There was a quite remarkable discussion at LB’s inquest where Paul Bowen puts the CQC failings to Lesley Stevens. PBQC states that CQC inspected on 10 domains and Southern Health failed on each one, Lesley Stevens agrees; he asks if she’d say it was a damning report, she responds yes. While this is factually correct, and what CQC found and reported, it is beyond offensive that Lesley Stevens would bring this up. What point is she trying to make? It’s not about our leadership because some of our care was good and some of it was bad enough to cost a young man his life? There’s some positive and therapeutic work happening in one unit, even though the one next door has an impoverished environment, and oh yes, we’re at an inquest into the death of a young man who was in that impoverished environment. Last month an inquest into the death of 15 year old Christopher Brennan who died under the care of South London and Maudsley NHS Foundation Trust concluded. The coroner found that Christopher’s death was contributed to by neglect and she referenced the failure to conduct adequate risk assessments. How did SLAM respond? What NHS professional/employee/communications expert ever deems it acceptable to claim a CQC rating of good, in response to an inquest verdict of neglect? Here’s the deal, if your failings contribute to someone’s death. Say sorry. To their family, not to the media. Apologise and mean it. That’s it. If you must, you can use the CQC report for your internal back slapping/tea party/morale boost email to staff, but it has no place in responding to an inquest verdict. It’s utterly inhumane. Those loved ones have the rest of their lives with a hole in it. Your CQC rating is entirely irrelevant to that. 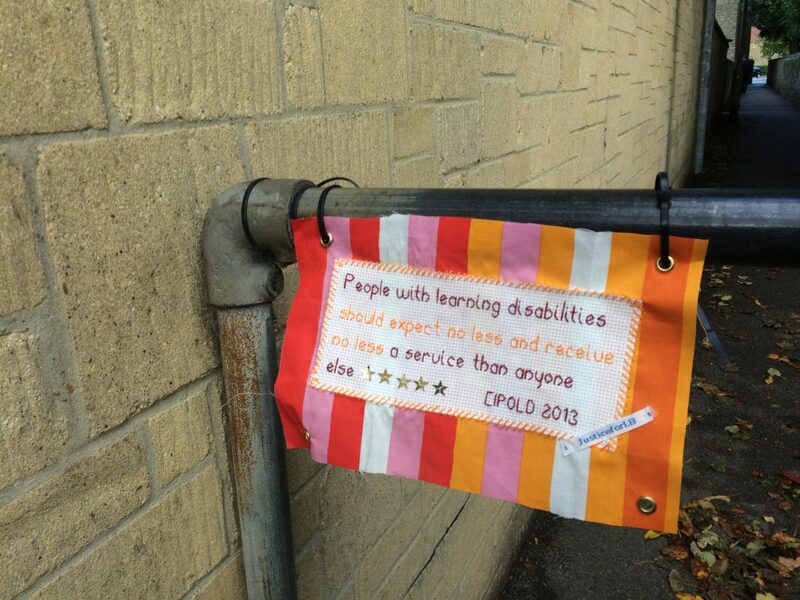 We hope that the spotlight that has been shone onto the careless and inhumane treatment of learning disabled people leads to actual (and not just relentlessly talked about) change. It is too late for our beautiful boy but the treatment of learning disabled people more widely should be a matter of national concern. We’re still hoping and still shining that spotlight, and will continue to do so until the change actually happens.